Robert Pierpont opens, narration, view of personnel. President Johnson eating with men and then speaking to ship's crew. President Johnson meets former President Eisenhower and both men play golf. _-_ _-_ This item consists of raw, unpackaged, news materials relating to President Johnson visiting an aircraft carrier during the Vietnam War. The massive enemy offensive at the Lunar New Year decimated the Vietcong and failed to topple the Saigon government, but led to the beginning of America's military withdrawal. 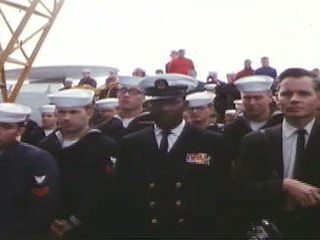 Chicago: “Vietnam: A Television History; Tet, 1968; LBJ Visits Aircraft Carrier with Dwight Eisenhower,” 02/19/1968, WGBH Media Library & Archives, accessed April 25, 2019, http://openvault.wgbh.org/catalog/V_3E88DA7A1D054E8B9F62A3F60F6488A5. MLA: “Vietnam: A Television History; Tet, 1968; LBJ Visits Aircraft Carrier with Dwight Eisenhower.” 02/19/1968. WGBH Media Library & Archives. Web. April 25, 2019. <http://openvault.wgbh.org/catalog/V_3E88DA7A1D054E8B9F62A3F60F6488A5>.